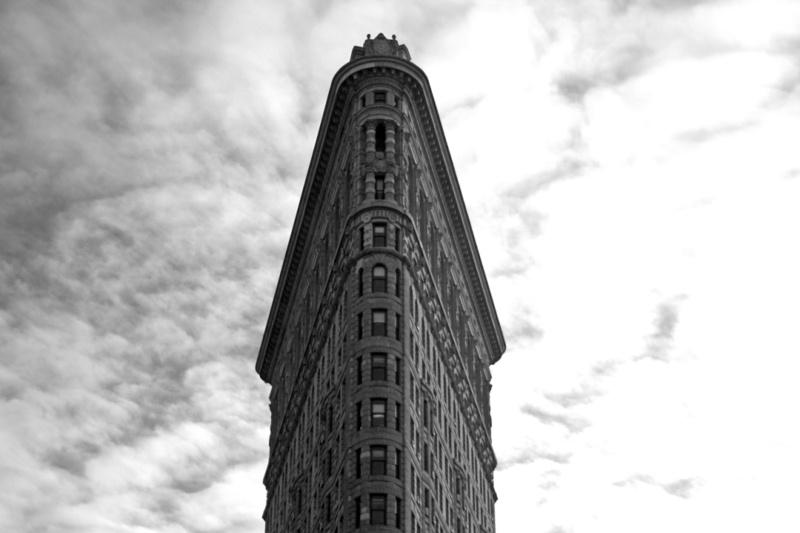 The Flatiron Building was designed by Chicago's Daniel Burnham as a vertical Renaissance palazzo with Beaux-Arts styling. Unlike New York's early skyscrapers, which took the form of towers arising from a lower, blockier mass, such as the contemporary Singer Building (1902–1908), the Flatiron Building epitomizes the Chicago school conception: like a classical Greek column, its facade – limestone at the bottom changing to glazed terra-cotta from the Atlantic Terra Cotta Company in Tottenville, Staten Island as the floors rise – is divided into a base, shaft and capital. The Flatiron’s interior is known for having its strangely-shaped offices with walls that cut through at an angle on their way to the skyscraper’s famous point. These “point” offices are the most coveted and feature amazing northern views that look directly upon another famous Manhattan landmark, the Empire State Building. There are oddities about the building's interior: to reach the top floor, the 21st, which was added in 1905, three years after the building was completed, a second elevator has to be taken from the 20th floor; on that floor, the bottoms of the windows are chest-high; the bathrooms are divided, with the men's rooms on even floors and the women's rooms on odd ones. Architect: D.H. Burnham & Co.
Nobody's looking for a puppeteer in today's wintry economic climate. Do you know what a metaphysical can of worms this portal is? You see the world through John Malkovich's eyes. Then after about 15 minutes, you're spit out into a ditch on the side of the New Jersey Turnpike!